JP Enterprises Barrel kit for a new build? Hello everyone. This is my first foray into the realm of .308 so please excuse any newb questions. I obtained a JD Machine Tech matched upper and lower. They are DPMS compatible. My question is in the choice of barrels. I want to stick to a minimum 20" barrel. 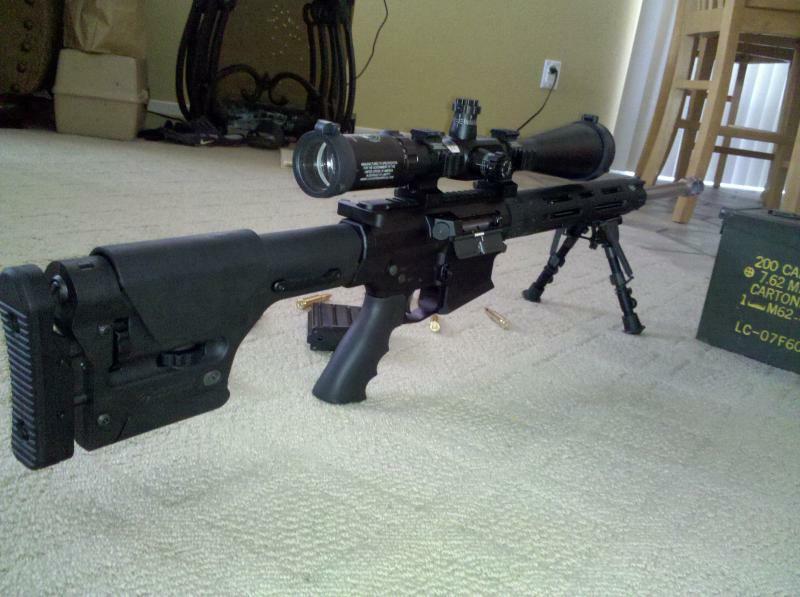 I have looked into an actual DPMS 24" bull barrel and a JP Enterprises 22" medium contour barrel. I have heard good things about the DPMS barrels but 24" is slightly on the long side for me. At 22" the JP is looking more appealing. I can't seem to find any reviews or info on the JP beyond what is on their web site. Any one out there have any experience with these barrels? Any info would be appreciated. Im not sure why but I dont seem to come across many folks with JP rifles of any sort so I have no help to offer. Part of the answer depends on what you are going to use the rifle for? The 24" bull barrel is great for bench rest shooting at long range, but if you plan on carrying it very far the medium contour would be a better choice. The DPMS barrels are production barrels and have no accuracy guarantee, if you require an exceptionally accurate barrel, than you should buy something that is specifically sold as a match quality barrel. Thanks for the answers so far. The planned use for this build is long range bench shooting. I would like to start experimenting with 600 - 1000 yard shots. The JP barrels claim to be supermatch, but a manufacturer can say just about anything they want. That doesn't make it true. That is why I was looking for actual personal experience. Thanks for the alternatives. I will investigate them. Rob and the guys down there are super cool. I've stopped by a few times to chat and they have been very helpful. Did he let you hold the 13.7" w/pinned noveske pig? That gun was sweet. 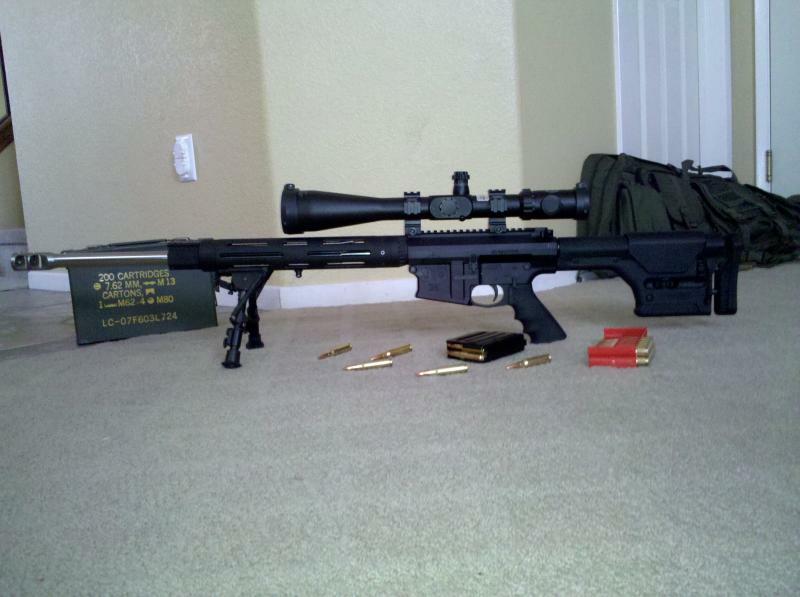 As for JP, they were less than helpful when I emailed them about their .308 carrier. I was pretty set on ordering that and one of their barrel sets, but they turned me off to it pretty quick with poor customer service. I'm usually working during most companies business hours, so I rarely call anyone. I'm so used to shooting emails that I just do it without much thought anymore. Maybe things would have been different if I had called them, but they were short and no help with their response to my email and never even responded to the second. I wound up going with Fulton for most of my parts after that. Look forward to seeing your build. Thanks for the heads up DNP. I had read your post on the rear detent screw. Rob hooked me up with 2. One to use and one to loose I guess. I called JP to place my order and they were extremely helpful on the phone. I ended up getting the 22" barrel kit (which included the adjustable gas system & comp), heat sink for the barrel, Complete bolt assy, and handguard. They even threw in a discount. ;D Since I can't take a picture to save my life, I am going to have to hook up with you for some good pics once it is complete. You have mad photo skills by the way. Sounds like a plan. <thumbsup> Can't wait to see your build. I just finished an 18 inch upper and used the JP barrel. I called and ordered it, got great service from a knowledgeable CSR. I'm moving to the Heavy Optics division in 3 gun and the 24 inch fluted barrel on my DPMS was a little too long/heavy for that application. I have had really good accuracy results, (5 shots, 125 Nosler BT into 1.12 inches at 200 meters) with the JP barrel. That is about as good as I can hold the rifle or see for that matter. I think that you will be pleased. I received the upper assy goodies last week. The stuff sure looks purdy and I couldn't help but get it assembled the next day. Still waiting on a stock and optics. I used the A2 stock off of my AR-15 and a cheapo scope off of my AR15-22 to "temporarily" completed the build. I was anxious to try it out and start the break in process that JP recommends. Can't really attest to the accuracy as of yet. Still breaking the barrel in and haven't mounted good optics. I was also using inexpensive ammo. The grouping started out wide and started tightening up as I progressed through the break in process. The masterpiece is not completed yet ;D The stock arrives on Thursday. I am debating on wether to take pics then or wait for the optics to arrive for a completed presentation. Well, the wait is over. For parts anyway. Now comes the wait for range time to break it in. Thanks. One major problem I have run into is that the stock DPMS factory trigger is horrible for accuracy. It has a super heavy pull and loads of creep. Any advice on a precision trigger I can use for better accuracy? I would prefer something that isn't too complicated to install. Not that I am not capable but the simpler the less can go wrong. I was thinking maybe a geiselle SSA or the likes. We have a few threads on triggers but my favorite is the ATC SR Gold. ATC Gold is by far one of the best triggers for AR platforms that I have ever shot. They aren't cheap but they are good. I just ordered another one for my 6.8 rifle.